After opening our doors on February 2017, we sadly announce the closing of the gallery. 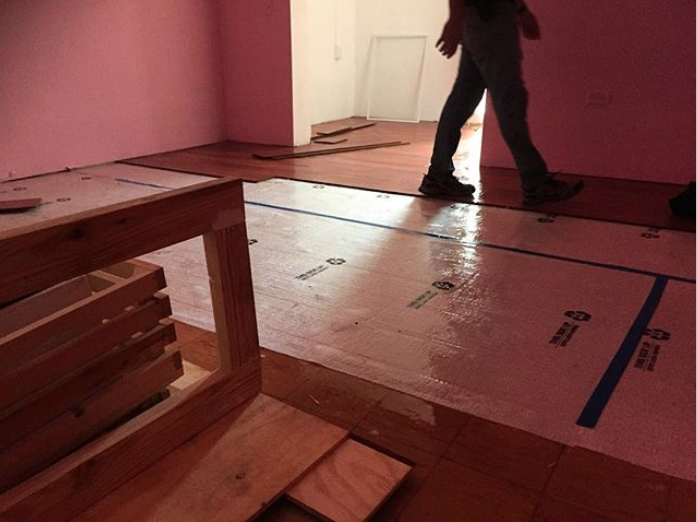 Due to a combination between post María Hurricane heavy rains and a damaged sewer system the gallery flooded on two different occasions damaging the newly installed wooden floors, doors and drywall. We are currently on the look for a new exhibition space. La Mano del Pescao que Guinda explora elementos como la mano y la comida en contexto social, psicológico, geográfico e irreverente. Esta exploración se da mediante diez pinturas que parten de las experiencias personales de los artistas. La influencia cotidiana de factores tales como la televisión, el internet, libros, historias callejeras y la interacción humana, es clave para la creación de estas obras. Márquez emplea su versión del emoji correspondiente a la acción de dar un “like” o “me gusta” como símbolo de aprobación contemporánea. Aprobación que se genera en las redes sociales, que a la vez que psicológicamente otorga al receptor del “like” confianza y seguridad emocional sin confrontaciones, otorga valor psicológico y presencia a la opinión del emisor del “like”. Por su parte, Velázquez adhiere al lienzo esculturas-replicas de comida (aguacates, plátanos, panes), creando composiciones asociadas a expresiones faciales de tristeza, asombro e incertidumbre. Las esculturas flotan sobre brochazos horizontales que se difuminan logrando gradientes de color cuales aluden a cielos despejados, saturados de color. El artista presenta la comida como elemento mágico del recuerdo, de estados anímicos, de lo precederos y concibe instantes que capturan una pausa de lo que siempre esta en constante cambio. A base del humor, la irresolución, dominio técnico de concepto y vocación, ambos artistas logran imagines surreales contenidas en el espacio de reflexión que bien puede ser el canvas y/o la sub-conciencia. La Mano del Pescao que Guinda se presenta en la galería Zawahra Alejandro en Santurce hasta el tres de noviembre. Para mas información o coordinar una cita para visitar la muestra puede escribir a zawahraalejandro@gmail.com o llamar al 787-400-0599. MECA, short for MErcado CAribeño (Spanish for "Caribbean Market"), will take place in Santurce, from June 1st - 4th of 2017 at the Puerto Rico Music Conservatory. Founded and directed by Tony Rodríguez and Daniel Báez, MECA will be the meeting point par excellence and definite international platform for the Caribbean art market, made up of a vibrant assembly of young artists and galleries. MECA's main objective is to stimulate collectionism and educate in favor of investing in contemporary art. Puerto Rico has a maturing art market—with a buoyant artist community—that is making a splash in the international art circuit, subsequently highlighting opportunities for strategic investments in the Island. Zawahra Alejandro will show new works by Danny Rivera Cruz, Diego Zaks and Héctor Madera. The art works to be shown all have in common the internet as a essentail medium. Miranda's Nos Comieron los Dulces is the first exhibition at the ZAWAHRA ALEJANDRO new space in San Juan, PR. The installation, which demands crowd participation, opens February 24, 2017 at 7pm. The exhibition will run through May 19, 2017. Zawahra posing in front of Rafael Miranda Mattei's work. Izam Zawahra was interviewed by established journalist Carlos Ochoteco for the November issue of Imagen Magazine. In the three page spread Zawahra talks about his formation as a dealer and forthcoming projects. Héctor Madera at TerremotoMX Blog! Click here for the full article and images! Abstraction, when derived from or merged with representative aspects, purveys an alternative visual language and revises our perceptual experience. The human face and head, infinitely fascinating, have been portrayed in myriad contexts and styles throughout the history of art; equally fascinating is what goes on beneath that physiognomy. HeadSpace, inspired in part by Church’s recent show of portraits at Zawahra’s Espacio 20/20 gallery in San Juan, poses questions about the perception of external appearances in conjunction with what occurs internally in the realm of the “head,” encompassing facial expressions, psychology and thought processes. Conveyed through nonconventional, often oblique, approaches to portraiture, the works in HeadSpace pose questions about perception as influenced by what we know and what we believe, as discussed in John Berger’s seminal 1972 “Ways of Seeing." HeadSpace is organized by Amanda Church, Kim Uchiyama and Izam Zawahra. For more information, please visit the gallery's website: www.morriswarrengallery.com. "Through the employment bold and colorful images, I wanted to achieve an environment where feelings of sadness, tension, anxiety, disorder, euphoria and happiness—just to mention a few—were all tangled up, creating a disparate and muddled celebration of the ups and downs of the everyday life." Click on the image for the full interview. On sunday, October 25, 2015 at 6:30pm Ivelisse Jimenez' site specific installation will be revealed. The large-scale installation "No Trates te Regresar" (Don't Try to Come Back), will be open to the public after an international simposium compose of Luis Camnitzer, Mart Gili, Alfredo Jaar, Cuauhtémoc Medina, Marie Carmen Ramírez and Beatriz Santiago Muñoz. The international simposium starts at 9:00am at the the University of Puerto Rico, Río Piedras Campus theater and Jiménez work will be on view just steps from the theater at the Museo de Historia, Antropoligía y Arte. Ernesto Cánovas’ latest works, with their composite of references to both history and popular culture, recall the words of American writer and critic Susan Sontag, who stated in her most famous work ‘On Photography’, that “to collect photographs is to collect the world.” Indeed, this certainly rings true for Overlapping View, where the artist makes use of his diverse source material to transport his spectators from a tropical paradise to an arctic glacier, to a household interior or even to the surface of the moon. In these elegant works, our journey encapsulates fleeting moments at once familiar and unknown, half-remembered scenes not easily forgotten. Cánovas’ seamless alternation between aspirational glamour and the visual language of the everyday is reminiscent of the flickering of a film reel, each image closely contemplated and carefully manipulated before it is reborn to the world. Madera, who is well know for employing paper, cardboard and colored tape along with paint and photography in his mix media works of art, will be part of the Cut N Mix group show this summer at El Museo del Barrio in New York City. Curated by Rocio Aranda-Alvarado, Cut N Mix explores contemporary Latin American collage. Cut N Mix opens on July 22nd, 2015. From left to right; curators Alexia Tala, Gerardo Mosquera, former Director of the Culture Institute of Puerto Rico Lilliana Ramos Collado, and artist and independent curator Vanessa Hernández Garcia at the press conferenece. Gallery artist Ivelisse Jiménez have been commissioned a site-specific work of art for the up coming Trienal Poli/Gráfica: San Juan, Latino America y el Caribe. The Trienal Poli/Gráfica will run from October 2015 thruogh February 2016. Installation view of By the Pleasure of Doing group show, curated by Juan Alberto Negroni at Espacio 20/20. Espacio 20/20 is a non-for profit emerging art space from San Juan, Puerto Rico. With just over two years of existence the popular space has celebrated around 25 exhibitions plus three off site nightlife and cultural events. More than 200 artists have shown their work during this period. On May 22, 2015, Espacio 20/20 will hold their first fundraiser event called Black Box. Thirty lucky individuals will have the chance to win an original work of art by well-known emerging and international artists from San Juan. The Black Box package have a cost of $150 and includes one small format original work of art, an Espacio 20/20 t-shirt, pin, sticker and tote bag combo plus access to the open bar. The artist’s list includes works by Alexis Díaz, Pedro Veléz, Héctor Madera, Sebastian Vallejo, Jonathan Torres, Pedro Fortunato, Fernando Pintado and Danny River Cruz plus many more. Embracing the contradictions inherent to painting, Ivelisse Jiménez’s work uses bright, vital colors to relate to the "cognitive opacity" of what is absent or only partially present. Her pieces integrate a variety of materials, many recycled, within the visual referent of painting, while extending into the space and responding to the particular installation site. This conjunction of the formal and the informal the considered and the encountered, gives Jiménez’s work an elegant unpredictability. The work’s playful freedom often belies its rigorous engagement with abstraction. Sebastian Vallejo's "Lush" and "Corazón al Sol" paintings at Museo de Casa Blanca beside Zilia Sánchez' works of art. As part of the commemoration of its 60th Anniversary, the Institute of Puerto Rican Culture (ICP) announced that the sixteenth edition of the National Exhibition of Fine Arts opens this coming March 14, 2015 at 7:00 pm at the Antiguo Arsenal de la Maria Española and the Museo de Casa Blanca. This magnificent display of Puerto Rican art is dedicated to Olga Albizu and Zilia Sánchez, two important pioneers of painting and national art, who established guidelines for major aesthetic proposals. During this landmark event, 152 works of art by 123 artists, were selected by the Advisory Commission of Fine Arts Program, a total of 531 works were submitted by 258 artists who responded to the call by the ICP. Ivelisse Jiménez, "Detour 21" (2012), at the Antiguo Arsenal de la Marina Española. Heector Madera, "I was Lost but Being Lost Never Felt so Good" (2015), at the Antiguo Arsenal de la Marina Española. info: Programa de Artes Plásticas del ICP al (787)724-5932. Zawahra Alejandro presents work by a diverse group of artists whose innovative approach to depicting abstraction, urban landscapes, and the disappointments and victories of everyday life reveal a unique relevance. Ivelisse Jiménez and Gracjana Rejmer-Cánovas have abandoned the production of traditional painting in favor of creating solid works of art that establish refreshing dialogues. They do so by actualizing abstract concepts onto geometric, color-field formations that captivate the viewer. For Ivelisse Jiménez, elements of concurrence, contraction, and uncertainty are inherent to her work. Her constructions consist of adapting diverse industrial materials in a manner that takes full advantage of the exhibition space and showcase a hidden and not-so-hidden meaning. Conversely and inversely, Gracjana Rejmer’s uncommon works are composed of disparate textiles that she submerged in pigmented water—allowing for a rare artistic yielding of control as the final color results depend on the manner and level of saturation in which the various fabric textures can absorb color. The process produces provocative contrasts that subtly reference the effect of time and the beauty of decay while yielding truly one-of-a-kind pieces. Ada Bobonis’ work focuses on various panoramas—urban habitats that are under construction, isolated locales, and areas that have no discernable definition. Through the mediums of photography and sculpture, the artist depicts settings in which the past and present coexist in a state of permanent contradiction. Sebastian Vallejo’s large-scale works integrate chromatic fabrics that carry visual and cultural allusions to the tropics of the Caribbean island from which he stems. In a process of two, Vallejo’s work either showcases a direct transfer of the fabric’s flora and fauna to canvas, or the incorporation of fabric onto the canvas which is then enhanced with hand-applied paint in a seemingly haphazard manner that yields a shockingly harmonious ode to color and country. The artist’s work—in both cases of approach—exhibits the realization and universal language of experiment behind historical works of abstract art. Ernesto Cánovas explores the concept of irony with beautifully conceived works of art that showcase the depravity and atrocities forged by the human race. Cánovas uses a unique style of light manipulation to showcase dimensional, pulverized landscapes that seen all at once, instill a reflective quality in which the viewer is forced to see past the painting’s beauty and acknowledge the essence of the artist’s statement. The intentional idealization and beautification of a serious subject matter in an attempt to both hide and display the artist’s disquietude with said subject, is a characteristic that both Cánovas and Héctor Madera’s works of art share. In Madera’s latest body of work, drawings of faces inked with woe or joy, illustrated geometric forms, and abstract doodles all give shape to feelings of melancholy and mirth felt through multifarious states of confusion and clarity. To engage the viewers and to simultaneously create an ambience in which the artist’s frustrations are discernible and tangible—Madera’s riotously-colored creations are exhibited on photography backdrop paper that flows from the ceiling to the floor. Not of the do-not-touch variety, Madera’s interactive exhibit performs dual functions—it allows the artist to attempt to work out his frustrations through the viewer’s participation and immersion in the art itself, while also allowing our selfie-obsessed generation to have fun and take that coveted selfie.